Grieving animal lovers can now call a national hotline that has been set up to connect people with qualified and experienced counsellor who can help them cope with their loss. At the time of launch there were 10 service counsellors based across Perth, Adelaide, Melbourne, Sydney and Brisbane – with the service continuing to expand and offer connections with more and more professionals. 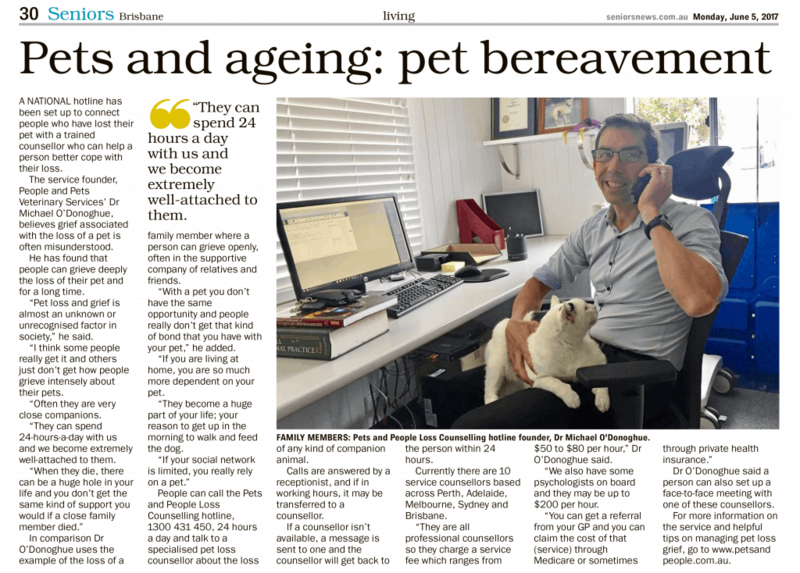 Dr Michael O’Donoghue established the service so that people could call 1300 431 450, 24 hours a day and talk to a specialised pet loss counsellor about the loss of any kind of companion animal. Calls are answered by a receptionist 24 hours a day, 7 days a week and transferred to a suitable counsellor if there is one available on the line, otherwise the caller will be contacted by return phone within 24 hours. Counselling rates may vary according to the service provider and will be discussed with the caller before proceeding. If you’re in need of help free of charge, Dr Michael O’Donoghue has also curated a list of counselling and support centres that offer complementary or donation based services – this list is available on the Grief and Bereavement Support page his Pet Loss Support website – Pets & People. As of August 2018 this service now extends to New Zealand with the dedicated hotline 0800 114 421 available for local NZ callers.